Our precision engineered range of cap sealing machines is widely in demand owing to its high end features such as accurate functioning, durability and corrosion resistance. Fabricated according to the specifications provided by the client all our machines are easy to install and also widely demanded in the global markets. 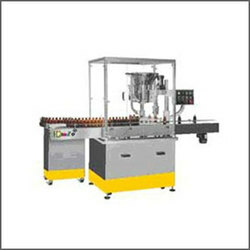 Our range of cap sealing machines includes semi automatic capping machines, screw cap sealing machines, ropp cap sealing machines, automatic screw cap sealing machines, automatic shrink sleeve machines and automatic capping machines. 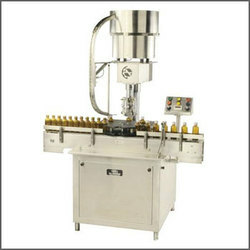 Our specifically engineered semi automatic capping machines is suitable for cap sealing purposes in various industries. This machine is renowned for its low noise and accurate functioning. 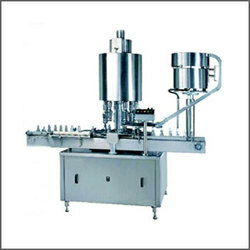 It is highly durable, long lasting and cost effective in nature and can synchronized easily to on line machines zone like as fillers, induction seal, cartonator, washer and labeler. We offer a quality range of automatic screw cap sealing machines which are manufactured on sturdy welded steel frame including stainless steel sheet and doors to facilitate the servicing of machine. Our range is flexible, self-supported on stainless steel leg with height adjustable adjustment system. The feed container which is moving on conveyor belt is feed into an in-feed star wheel, bringing the container below the sealing head in the subsequent indexing part. When the rotating head pickup a cap from the cap star wheel which is receiving from delivery chute of cap filling bowl, the body and the neck of the container are positioned below the rotating head. Where the sealing head is performing perfect operation of sealing, rotating head is design to seal container according to pre-set torque. We are a renowned manufacturer and exporter of automatic shrink sleeve machines that is meant to provide the customers with durable and economical solutions. These machines are specially designed and have a maximum speed of 100 BPM and are also available in customized as well as standard options. 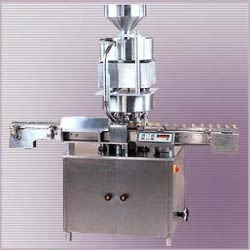 Looking for Cap Sealing Machines ?